Many mysteries and legends shroud the shores of this high alpine lake on the border of Peru and Bolivia. 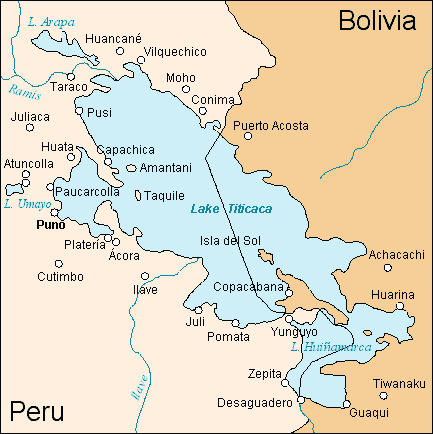 Not only is Lake Titicaca the highest navigable lake in South America, it is the world’s largest mountain lake at 3,200 square miles (8,288 sq. km), and the second deepest alpine lake with a depth of 1,000 feet (305 m). Lake Titicaca has been a sacred body of water to South America’s indig­enous people since pre-Inca times. According to Indian lore, the legendary god Viracocha arose from Lake Titicaca and went to Tiahuanaco to create the first Andean human being. It was long rumored that sunken temple existed at the bottom of the lake, and these rumors were substantiated when modern scien­tists explored its depths. Scholars have long been intrigued by tales of ancient palaces seen by fisher­men during dry spells when the lake level dropped, or of local Indians diving down and touching the roofs of stone buildings. Even early Spanish chroniclers recorded Inca stories of a great flood long ago and ruins on the lake bottom. Stories of the lost treasure were enough to draw the famous French oceanographer Jacques Cousteau to explore the lake. However, he discovered only ancient pottery. In 1967, a scientific expedition authorized by the Bolivian government began exploring the depths of Lake Titicaca. National Geographic also launched an expedition in 1988. The ruins of an ancient temple have been found by international archaeologists under Lake Titicaca, the world's highest lake. More than 200 dives were made into the lake, to depths of as much as 30m (100ft), to record the ruins on film. The divers found high walls covered in mud and slime and eaten away by the brackish water. Not far from the shore, a number of paved paths led into the lake and connected to a large, crescent-shaped base. The finely cut stone paths, numbering 30 in all, were set with great precision into the ground in a parallel formation. Another expedition in the year 2000 located and documented a 660-foot (200-m) by 160-foot (50-m) temple after following a submerged road, almost twice the size of an average football pitch in an area of the lake near Copacabana town. 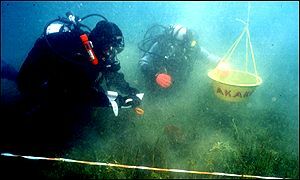 To date, no conclusive answers have been given as to who may have built the monuments before they sank. A terrace for crops, a long road and an 800-metre (2,600 feet) long wall was also found under the waters of the lake, sited in the Andes mountains between Bolivia and Peru. Dating back 1,000 to 1,500 years ago, the ruins are pre-Incan. The Incas also regarded the lake as the birthplace of their civilization, and in their myth, the Children of The Sun emerged out of the waters. "They have been attributed to the indigenous Tiwanaku or Tiahuanaco people", said Lorenzo Epis, the Italian scientist leading the Atahuallpa 2000 scientific expedition. The complete findings of the 30-member team, backed by the scientific group Akakor Geographical Exploring. The lake has long drawn fascination with various legends around it, including one of an underwater city called Wanaku and another of Inca gold lost by the Spanish. The research involved 10 scientists from Italy, 10 from Brazil, five Bolivians, two Germans and a Romanian. "Ancient stories of massive floods pass from generation to generation and in many places in the world are integral to a people's spoken history. The tales differ by locale, but commonly feature either torrential rains or a hugely destructive wall of water bursting into a valley, destroying everything in its path. In many cases, the flooding is an act of retribution by displeased gods. Scientists, historians, and archaeologists view many of these enduring tales as myth, legend, or allegoric tales meant to illustrate moral principles. Recent findings indicate that at least a few of them could be based on real floods that caused destruction on an enormous scale." The lower altitude terraces where corn could still grow are still at a level above Lake Titicaca. This means that the "pre-historic" peoples cultivating corn "lived" in the area "before" and "after" the numerous necessarily cataclysmic crustal deformations and uplifts that raised the Andes. The cataclysmic uplifts caused the terraces where the corn "was" successfully cultivated to be raised to an altitude where the corn would not grow. As the mountains rose cataclysmically the peoples terraced their cornfields successively lower down the mountainsides. There is a stone causeway leading "out" of Lake Titicaca. It has been speculated by some of your archaeologists that the area used to be at sea level and the causeway led out to the Pacific ocean. The causeway now leads out of the lake to nowhere at 9000 feet altitude. There are stone "ruins" more "ancient" than the stone causeway leading out of Lake Titicaca. These "ruins" are buried under six feet of "sediment" on the shallow "bottom" of Lake Titicaca. The sediment contains "pre-historic" (more ancient than 12,000 B.C.) sea shell fossils. There was not enough topsoil on the peaks surrounding Lake Titicaca to have "eroded" down and "covered" these "ancient" ruins with six feet of sediment. The six feet of sediment covering the "ancient ruins" around and under the present "water level" of Lake Titicaca was probably deposited by the "Biblical Flood" before the existence of Lake Titicaca. 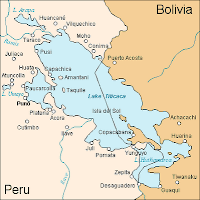 The huge Flood happened "pre-historically" when the land around Lake Titicaca was closer to sea level. historical stories are always interesting, Who would have thought in the pre-inca civilization so advanced in its time. It can be seen from the relics they left behind. You are right international times. Ancient civilizations were far more advanced than what we think. We should belive the stories related to them. Now it is the time for Mayan prophecy to be tested... 2012!!!!!!! (@ The International Times) Yes, i agree with you as well. Ancient civilization still shrouded in mystery, some believe these ancient people came from outer space and because some unknown reasons they leave and abandoned their ancient buildings. Very cool research. I'd like to know more about these lost civilizations.